The Jury was in a quandary and entered a special verdict. “If purchasing, paying for and possessing and improving lands for more than 20 years without a deed in writing will give legal title, for the defendant [Onge]. Otherwise for the Plaintiff.” The bench resolved in the negative; [meaning] for Fuller. Court Rulingi. July 30, 1679 – Transcribedii. Court Judgementiii. Aug 2, 1679 – Transcribediv. Treanscription: To the Marshall of Midd[lesex] or his Deputy. John Fuller Testamentv. – Transcribedvi. General Court Judgementvii. 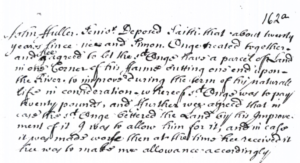 – Oct 15, 1679 – Transcribedviii. The General Court reversed the Middlesex judgement. 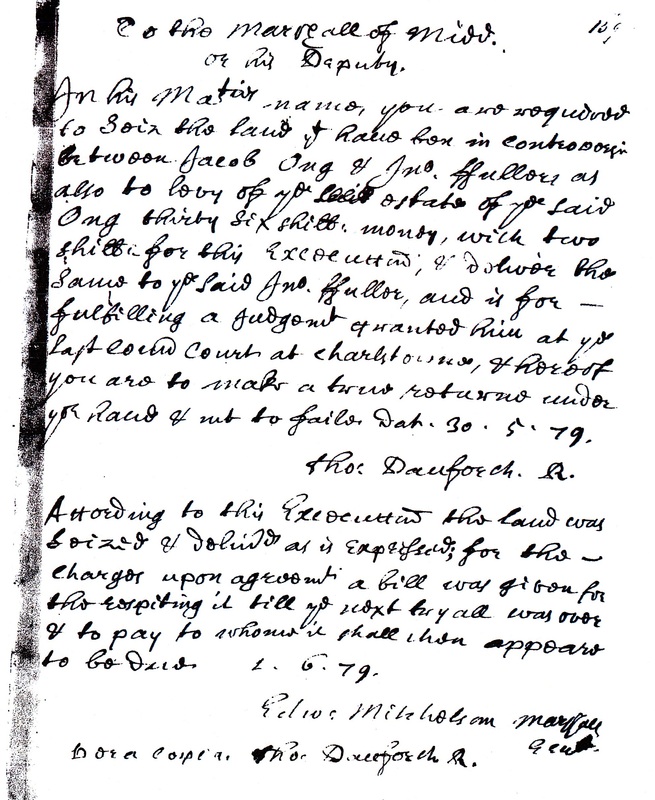 They decreed that Jacob Onge should have the lands in dispute unless John Fuller paid him £60 within two months. Fuller must also stump up the large cost of £11.12.6. 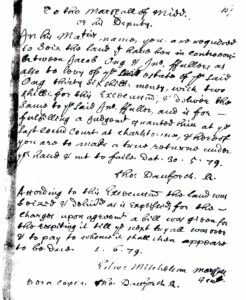 1672 – The Law – Possession of Land in the Absence of a Deedix. They were probably persuaded by a gloss on the law about possession issued on 15 May 1672. This affirmed that long-term occupation of land even without written evidence of purchase could be taken to prove ownership. Did the Fuller vs Onge Trials Lead to a Clarification of the Lawxi. Excerpts from a summary of the court proceedings by Roger Thompson, “Cambridge Cameos” Stories of Life in Seventeenth-Century New England; NEHGS, Boston, 2005. Inventory: MPR, 5: 65-66. MxCC D&O, 4: folio 84; DB, 3: 257, 260, 273. 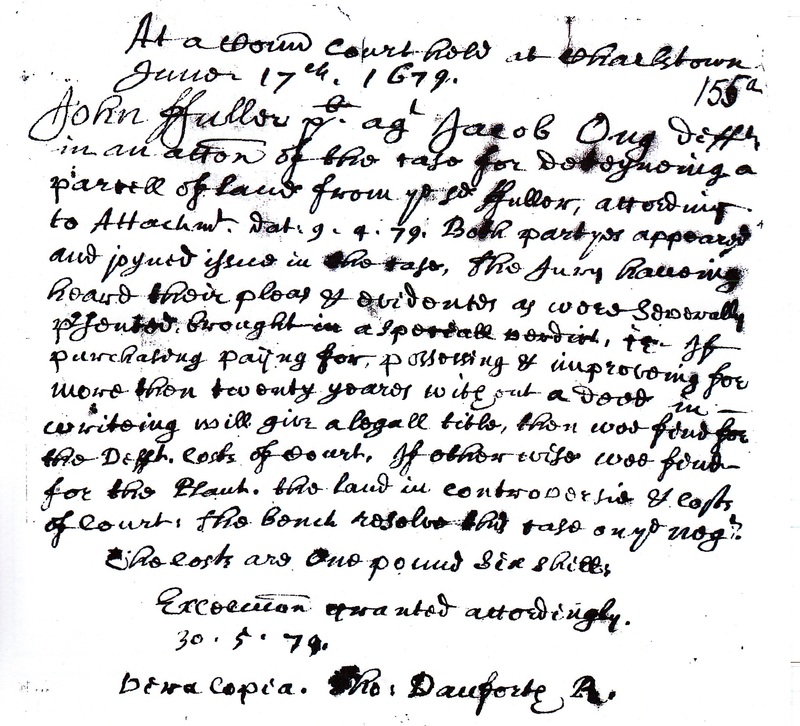 The first deposition questioning Fuller’s claim is dated 15 February 1679. 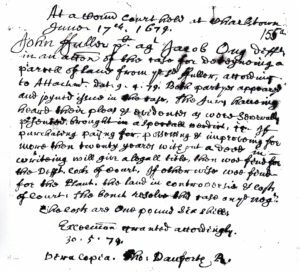 Testimony of John Fuller Jr., 30 and Jonathan Fuller, 27, 17 June 1679. For a similar agreement between Richard Parke and John Gush, see Bush Seedlings. Thomas Parke was aged 50; Richard Barnes, 48; John Holden, son of Richard, 22. There is no evidence that indicates that the Court knew that Jusinian Holden was married to Simon and Jacob’s sister. MxCC DB, 3: 273; MPR, 5: 65-66. 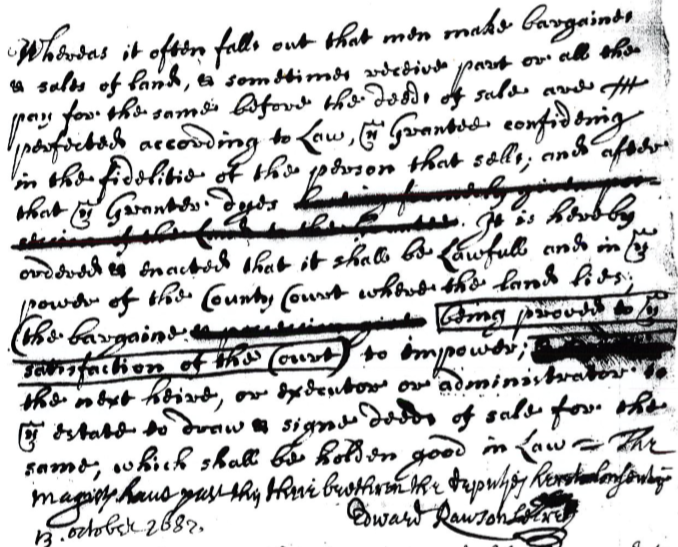 MR. 3: 280, 19 Oct 1652, the General Court ordained that all propery sales must be made in writing not by verbal agreement. Roger Thompson, “Reflections on the early-modern extended family” in Udo J. Hebel and Karl Ortseifen, eds., Transatlantic Encounters (Trier: Wissenschaftleicher Verlag, 1995) 62-78. Kenneth A. Lockridge, Literacy in Colonial New England (New York: Norton, 1974); Jack Goody, ed., Literacy in Traditional Societies (Cambridge: Cambridge University Press, 1969), Introduction. The petition was directed to the General Court rather than the Court of Assistants, because the verdict has been given by the Middlesex bench (Assistants). Mass Archives: 24 October 1679. 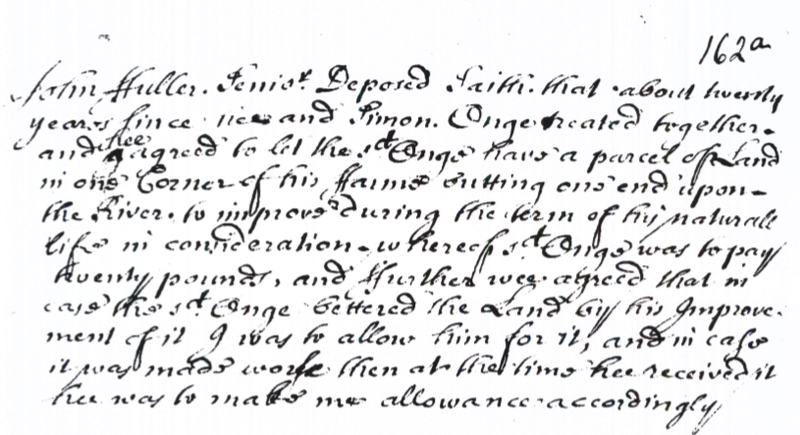 Testimony of Abigail Sawin, 50, Mass Archives, 24 Oct 1679; Joseph Garfield, 41, corroborated the lack of a deed and Simon’s belief that Fuller would get the land back. Verdict: MR, 5: 246. Gloss: MR, 4-2: 515. 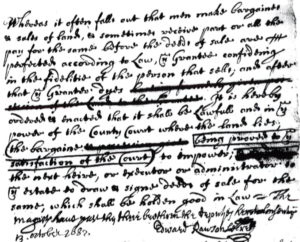 Clarification: MASS Archives, 13 October 1682. Massachusetts Archives Collection, vol. 16, No. 155a. Transcribed, D. Spelman, Norwich, Norfolk, UK. Massachusetts Archives Collection, vol. 16, No. 159. Massachusetts Archives Collection, vol. 16, No. 162a. Records of the Governor and Company of the Massachusetts Bay in New England, vol. IV, pg. 238, Massachusetts Archives. Transcribed, Shurtleff, Nathaniel B., Records of the Governor and Company of the Massachusetts Bay in New England, (Boston, MA, 1853), vol. V, pg. 246. Records of the Governor and Company of the Massachusetts Bay in New England, vol. IV, pg. 693, Massachusetts Archives. Transcribed, Shurtleff, Nathaniel B., Records of the Governor and Company of the Massachusetts Bay in New England, (Boston, MA, 1853), vol. IV, part II pg. 515. Massachusetts Archives Collection, vol. 16, pg. 300. Transcribed, Shurtleff, Nathaniel B., Records of the Governor and Company of the Massachusetts Bay in New England, (Boston, MA, 1853), vol. V, pg. 375.